Blenheim Palace is a monumental country house situated in Woodstock, Oxfordshire, England. It is the principal residence of the dukes of Marlborough, and the only non-royal non-episcopal country house in England to hold the title of palace. The palace, one of England’s largest houses, was built between 1705 and circa 1722. Blenheim Palace was designated a UNESCO World Heritage Site in 1987. The building of the palace was originally intended to be a reward to John Churchill, 1st Duke of Marlborough, from a grateful nation for the duke’s military triumphs against the French and Bavarians during the War of the Spanish Succession, culminating in the 1704 Battle of Blenheim. However, soon after its construction began, the palace was to become the subject of political infighting; this led to Marlborough’s exile, the fall from power of his duchess, and lasting damage to the reputation of the architect Sir John Vanbrugh. 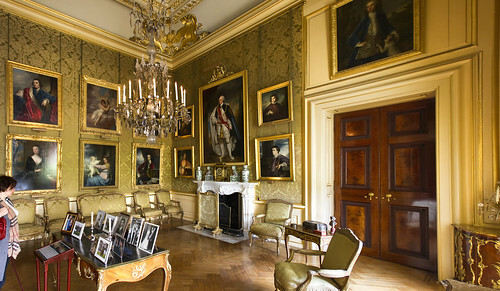 Following the palace’s completion, it became the home of the Churchill, later Spencer-Churchill, family for the next 300 years, and various members of the family have in that period wrought changes, in the interiors, park and gardens. At the end of the 19th century, the palace was saved from ruin by funds gained from the 9th Duke of Marlborough’s marriage to American railroad heiress Consuelo Vanderbilt. The exterior of the palace remains in good repair.